The next name on my list is that of the delegation of Pakistan. If the Security Council has no objection, I should like to address the Council in my capacity as the representative of Pakistan. By now, all the eleven members of the Security Council have expressed their views with regard to the adoption of this item of the agenda. It has now become clear that six delegations will not support the inclusion of this item. Amongst them are our friends and colleagues from countries for which we have the highest regard. Three of these countries certainly to the average man, represent strong colonial interests. A fourth great country which has no colonial interests has nevertheless chosen to side with them. It is quite certain now that if and when the question of including this item is put to the vote, we shall lose. Today, 10 April 1952, will go down in the history of the United Nations as the day on which the foundations were laid for the suppression of free discussion in the United Nations. As my wise colleague, Dr. Tsiang, the representative of China, with all his experience of the United Nations, has told us, this would be the first instance in the history of the United Nations, in which the mere adoption of an agenda item was opposed so stoutly in the Council, and to the kill. The last time my delegation addressed the Security Council was after the intervention of my distinguished friend, the representative of France. It would be extremely unfair of me to take advantage of a second opportunity to comment upon his speech. I shall therefore refrain from doing so. But I should very much like this time to read to my colleagues the opinion of the Government of France on the question of whether or not items should be included in the agenda; the opinion of the Government of France on this question on occasions when Tunisia is not involved. I shall read a quotation from a speech made by the representative of France on September 3, 1946, when the Security Council was discussing the Ukrainian complaint against Greece. This is what the representative of France, Mr. Parodi, said on that occasion: "In my view, to adopt the method of declining to place a question on the agenda involves serious disadvantages and risks. Furthermore, on what grounds can it be decided that the complaint is without proper foundation? Does it mean that the Council would judge on the basis of its a priori knowledge of the general political situation? That is possible. It would seem to me, however, somewhat dangerous for the Council to be guided solely by evidence of this kind. For how is it to assess such evidence if it does not examine the question thoroughly? It is to be feared that it would be influenced by general political considerations rather than considerations of justice applicable to the particular case put before it." Today the delegation of France - a great country and one of the five permanent members of the Security Council, one of the five permanent members who have reared the entire structure of the United Nations on the basis of justice, equality and free discussion - today, I am afraid, that delegation, to quote its own words has been "influenced by general political considerations rather than considerations of justice applicable to the particular case" before us. So far as my distinguished friend, the representative of France, and the intervention of his Government in this debate are concerned, I shall rest ; there. I was particularly disappointed, however, when I listened to the intervention of my friend, Sir Gladwyn Jebb, the distinguished representative of the United Kingdom. There are many pleasant things which the distinguished Sir Gladwyn and I share. Amongst them are love and respect for the English language. I must complain that the distinguished representative of the United Kingdom did violence to this common beloved of ours today. He read from the letter in which the eleven governments had brought this matter before the Security Council, and when he came to the sentence in which those governments had requested the Council to meet "with a view to taking necessary measures provided by the Charter to put an end to the present situation," he was pleased to call this phrase ambiguous. In other words, to him this phrase meant several things which were confusing. I put it to him that perhaps the best way of describing this phrase would be to say that these eleven nations had put their request to the Security Council in moderate and temperate terms and had given the Security Council the fullest scope under this phrase to do as little or as much as it thought fit to do. This, I submit to him, is not ambiguity - unless we do violence to the English language. From there he passed on too easily to say that at any rate his delegation did not believe that any solution should be imposed either on France or on Tunisia. Does the phrase that has been quoted include a single word which implies that force is to be applied, that anything is to be imposed? If that was the only objection that the delegation of the United Kingdom had, it was certainly open to that delegation to put forward suggestions and to make recommendations which would not involve imposing a solution upon the parties. It was open to the delegation of the United Kingdom to say: "Let us discuss the matter. Let us not impose any solution either on Tunisia or on France. Let us merely recommend to them that they should come together and solve their dispute." Would that have been an imposition? But, by putting his case as he did, the representative of the United Kingdom tried to give the impression, I am afraid, that the complaint we had submitted to the Security Council was vague and wooly, had a threat behind it, and contained some element whereby imposition on Tunisia or on France of a solution by the Security Council would become essential. Nothing could be farther from the truth. Today, those noble words have been forgotten. Today we are told, not that the bringing of this case will strengthen the principles of the United Nations, but that - and I am sorry to see this in the statement of the representative of the United Kingdom - bringing this matter to the Security Council and allowing a free and open discussion will have a bad effect upon the United Nations. If a free discussion has a bad effect on the United Nations, I fail to understand what the main function of the United Nations in the world of today can ever be. In order to save the United Nations from decay, and from the bad influence which eleven nations are seeking to cast upon it, the best way, in short, of preserving the United Nations according to him, " would be to stop all discussions and to have a nice quiet life, admiring the new building in which we are situated. He, and I think the representative of the Netherlands, have made one point very genuinely and very honestly. They have said: if we take any action now, if we discuss this matter in the Security Council now, the negotiations that are going on in Tunisia would fail. Negotiations between whom? We know that one party is the French. Which is the other party with whom the negotiations are being carried on? The entire Cabinet, which was the last popular Cabinet that Tunisia was given, is in gaol. All the nationalist leaders and workers, and every single intelligent person, more or less, who has shown any sympathy for the nationalist cause, has either been beaten up or put into gaol. Communications in Tunisia are extremely tight at the moment. With whom are the French at present discussing the matter? What are the negotiations which we jeopardize by discussing the matter here? What is the great delicate task that the Resident-General is carrying on in Tunisia which will be jeopardized by our opening our lips here? If a discussion in the United Nations ruins the task which the Resident-General is undertaking in Tunisia, and if free discussion in this international forum hinders him, why, then, it must be hindering him in something evil. It could not possibly hinder him in something good, because I do not believe that a discussion in the United Nations could have such a deleterious effect upon the welfare of mankind. We have also been told that by our discussing the matter we shall be giving encouragement to the unrest in Tunisia. This has been suggested from the very beginning. It was first suggested by the representative of France, and I believe that some delegations, quite genuinely, have had the apprehension that our words will somehow inflame people. There are two kinds of people in Tunisia: the Tunisians and the French. The French have landed thousands of troops with tanks, with guns, with armour of all sorts. The Tunisians, so far as (know, have no armoury and no arsenal. Therefore, if our words inflame anyone, it could only be the French who could effectively be inflamed. How could the Tunisians be inflamed? They can occasionally throw a bomb. They occasionally create a noise. But all of the total military strength in Tunisia is in the hands of the French. It is they whom we want to stop from carrying on this military operation at the moment, and from carrying on what we described as atrocities - a word which did not fall very easily upon the ears of the representative of France. There is nothing else happening there at present, except that the Resident-General is trying desperately to do something which he can present to the world as the start of new negotiations. This, coming from the delegation of the United Kingdom, was a matter of surprise to me, because no country in the world has as much experience of such situations as the United Kingdom itself. They very well understand how, on the Indian sub-continent, before the withdrawal of their power, national leaders were thrown into gaol time and again and governments were formed of "local notables" (to quote the phrase that is being used for the stooges in Tunisia), certain understandings were arrived at with the more moderate and the more reasonable elements, as they were called, and that none of these understandings ultimately worked. As long as the popular will was being ignored, no reforms could possibly have worked smoothly and efficiently. In the end, by a gesture which to my mind will remain one of the noblest in history, the United Kingdom thought it fit to negotiate with those whom it had once upon a time put into gaol; it was only then that lasting peace and friendship between the United Kingdom on the one hand and India and Pakistan on the other, was founded. Of this friendship we are proud. But it was not possible to do that until the United Kingdom took a bold imaginative step. Instead of improvising and living from day to day, trying to deceive the world as regards their intentions and their conduct, they took the bold imaginative step of getting down to the task and negotiating an understanding with the real representatives of the people. This is what the French are not doing in Tunisia, and this is what we expected the delegation of the United Kingdom to tell the French Government, basing it on their own experience of recent history. 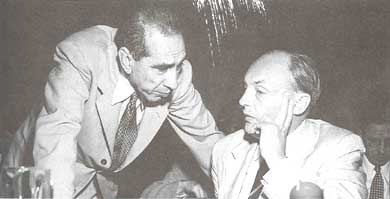 The press has revealed that about a fortnight or so ago, the French Minister of Overseas France and the British Colonial Secretary had talks together, the subject being Tunisia. I am sorry that the result of this flocking together of the two gentlemen was not a very happy one, if Sir Gladwyn's statement is based on the advice that they gave to His Majesty's Government in the United Kingdom with regard to the inclusion of this item on the agenda. Sir Gladwyn Jebb, with a felicity of language for which I envy him, was pleased to call himself a tortoise, and myself a hare, thus accusing me of impetuousness. He added that in the British Commonwealth, to which he and I and our countries have the honour to belong, there is room for many kinds of political animals. This is probably true, but if in the British Commonwealth there are any ostriches, they are not to be found in my country. I should like now to turn to what I consider to be the most unkindest cut of all; the stand taken by the United States on this issue. pleasure - and I think it will warm the hearts of many of us - in going over the passages, some of them very inspiring, in which the United States has during the past years, laid down this thesis of freedom of speech in the United Nations. I shall read out some of these passages in order to give a measure of the great change which has come over some of the major Members of the United Nations today. May I go as far back as the year 1946, when Mr. Stettinius, speaking on the Iranian case against the USSR, said: "I think the situation would be clarified in all our minds if we could agree on the question of these cases being put on the agenda for discussion at the next meeting of the Council. I wish to make it very clear that the United States Government believes that any Member country of the United Nations which makes a complaint has a right to be heard at this table. The same representative of the United States, speaking in February 1946 on the question of United Kingdom troops in Greece, said: "It is a good thing, when serious misunderstandings arise between States, that they should bring their problems before this Council." Mr. Johnson, another distinguished representative of the United States, discussing the complaint of the Ukrainian Soviet Socialist Republic against Greece in September 1946, said: "The position of my Government has consistently, since the organization of this body, been that the Council cannot deny to a Member of the United Nations who states that a condition exists that is likely to threaten international peace and security the opportunity to present its case. My Government attaches importance to that principle." Again, in the year -1947, the same Mr. Johnson, representing the United States, said the following in connexion with the Indonesian question: "The fact that there is shooting and that men are being killed in that region of the world is also very important. Thus it is a legitimate concern of the Security Council, no matter what concept of sovereignty is involved or what may ultimately be decided to be the fact." Again, speaking on the Chilean complaint regarding the violation of Czechoslovak independence by the USSR, Mr. Warren Austin said: "A decision on the question now pending is not a decision on the substance, and it would not constitute judgement upon the merits of the question. But when a question is raised, as it is here, whether an item should be placed on the agenda for discussion or not, there must be a consideration of the character of the question in order to learn whether the competence of the Security Council reaches the item." Mr. Austin went on to say: "Can the Security Council evade or avoid the responsibility that is placed upon it to give these charges a hearing - all of them? For these reasons, the United States will vote to place this item on the agenda." Yet that is exactly the attitude which many of those delegations which are opposed to our point of view are adopting on this particular occasion. Questions of competence, if they have not been discussed, have at least been hinted at. Some representatives have indicated what their stand would or would not be on the question of jurisdiction - without, however, consenting to place the item on the agenda. This great reversal by the United States, after such a clear line of thinking over several years, comes to us, I must confess, as a great disappointment. The first signs of this reversal were visible during the Paris session of the General Assembly last autumn. During that session, when the Moroccan question was raised, the United States took the decision to oppose the inclusion of the item in the General Assembly's agenda. Knowing the past history of the conduct and thinking of the United States on this matter, we felt that this was a small, isolated aberration from the path the United States had always chosen. Not only that: we were happy to remember - I must give all honour to the United States delegation for this fact - that the United States had never opposed the inclusion of an item, even though that item seemed to have implications of grave charges against the United States itself. It was because of this past history that we thought the vote of the United States on the Moroccan question was an isolated instance. There were, perhaps, many considerations which do not obtain in this case - which determined the vote of the United States on the Moroccan question. Perhaps one of those considerations was that we were meeting in Paris. Representatives will remember that one of the strangest speeches which we have ever heard in the United Nations was made by the Foreign Minister of France, who went to the rostrum and asked the Assembly to desist from voting in favour of including the Moroccan item in the agenda because, among other things, the Assembly was the guest of France at the time. It was heartening to find that, there were many delegations which did practice the courtesy which they had been asked to remember. But it would be even more heartening to find that kind of courtesy in the world today were it not for the fact that the lives and liberty of millions of Moroccans were in jeopardy at that time, just as the lives and liberty of millions of Tunisians are in jeopardy now. Whose guests are we here today that we should adopt the same attitude as was adopted in Paris? Therefore, today's abstention by the United States has a significance which the abstention in Paris did not have. We mourn that abstention. I am sure it is not for me to tell my friends in the United States and my friends in the United States delegation that this decision would be against a large body of liberal thought allover the world. We all know that, since last meeting of the Security Council, this question has been exercising the minds of people in many countries. There has been a great deal of heart-searching and cogitation everywhere. I do not know of a single liberal newspaper in any country, including the United States, which has taken the positive stand that shutting out this item would be a good policy. I am certain that the Untied States Government have taken the decision after a great deal of weighing and calculating of the risks. I have the fullest respect for their decision, and I hope, for the sake of the United States, that their calculations were correct. They and we, the eleven Members who have brought this complaint before the Security Council - and not only we twelve, but all freedom-loving nations today, in these times of stress and strain, are forever looking for greater and greater and larger and larger unities. That is the only way to save the world. I very much hope, for the sake of the United States, for our sake and for the sake of all those who love peace and freedom that this act of the United States will not prove to be an unnecessary obstacle in the way of such a quest. As far as I can see, having adopted this clear course for a long time, their reversal today will be very hard to explain to the world even for their best friends. It would almost look as though the United States had made up its mind to do a quick U-turn in a one-way street. What the consequences will be I cannot imagine. But I congratulate them on including in their statement many heartening words. They have condemned the use of force not only by the Tunisians, but also by the French. They fully realize that the instruments of force are not with the Tunisians, that the balance of such instruments of death is in favour of the French and not in favour of the Tunisians. I take it, therefore, that they have publicly warned the French not to use force. That is what the French have been doing in Tunisia all these days and that is what we fear they will go on doing unless world public opinion is aroused to the situation there. For how can they possibly say that they are not using force when not a single person of importance is free to walk the streets? I therefore welcome these phrases of goodwill and I think that the Tunisians will welcome them too. The Tunisians have on many occasions looked to the United States for help. The first time the Tunisians made an appeal to the United States was in President Wilson's time. People forget that there have been three or four major near-revolutions there. People forget that the present nationalist movement was born there in about 1904. It is not a creation of yesterday. Only, it is yesterday and today and last week that we have discussed the matter. The Tunisians will hear these words and I am sure that they will take heart. We shall also try to extract such consolation as we can from the last phrase that the United States has used, namely, that they will abstain "at this time". A similar phrase was used when the Moroccan item was rejected in Paris. When the Moroccan item was kept off the agenda, the phrase used was "for the time being". Today, the United States has chosen the words "at this time"
My colleagues know that in our professional diplomatic jargon the use of the words "at this time" is considered to be merely a face-saving device. By placing this phrase in a position in the sentence where it will have the maximum of stress with the minimum of meaning, the impression is sought to be created that there is a great and just reservation still in the mind. We shall not take the cynical view of putting that construction upon this phrase. I think the best way of interpreting this phrase would be that, here, a tiny ray of the American conscience has struggled through the mists of Atlantic diplomacy. As such, we welcome it and I hope that the time will not come when we shall have to hold the United States of America to its word. I hope that our failure will not mean the failure of the Tunisians. One further brief statement and then I shall have finished this part of my intervention. We are not working against the interests of France in this question. Nor do we fail to realize the great bonds of sympathy that tie together the various countries that stand on the other side of the fence today. We assure France that we have always admired that country for its heroism, and we have considerable sympathy for it in its trials and tribulations, which we know have not yet ended, and we do wish it peace and prosperity in the future. However, we have taken up this matter because we sincerely believe that the interests of France lie in coming to a peaceful understanding with the real Tunisian people, not with stooges of their own making. Mr. de Hauteclocque at the present moment seems to us to be engaged in some frenzied kind of card shuffling hoping that four aces will turn up at any moment. The four aces that he hopes to find he has already imprisoned. The French authorities seem to think that they are playing with us - the eleven nations that have come to the Security Council -a sort of a game of chess, that they must make a move quickly, otherwise something terrible will happen. We are not playing chess with them. Had we been playing chess we would have timed this complaint much more efficiently; we would have timed it when the French were not able to say "we are, carrying on negotiations". This is not a question of putting in the complaint on this or that day. If Mr. de Hauteclocque can produce out of his sleeve a Cabinet tomorrow, it will deceive no one in the world except himself. He is not trying to checkmate us. If he is, this will be no use to him. He is not fighting with us; we are not fighting with him. He is fighting history, and he will always fail if he chooses to have a headlong collision with the march of events. Therefore, I beg the French authorities in Tunisia to realize that this is not the occasion for playing a chess game with us and trying to beat us with their quick moves. This is a situation in which formation of Cabinets with what-the United States magazine The Nation calls "brutal speed" will solve the issue. The situation requires a much deeper understanding and a much closer analysis, and in the end, as my friend the representative of the United States of America said, the will of the people will assert itself. We are not working against the interests of France. I think it is the French authorities who are not working in the interests of France. They are working in the interest of a handful of French settlers who have got enormous vested interests there and whose lobbies in Paris are very strong and very vigorous. In France itself there is a vast body of liberal thought which has called the present situation in Tunisia "humiliating". France has great traditions of liberalism and r do not think that these 150,000 French settlers in Tunisia will dim those traditions. They may be able to put them into the background for a while, but they will not be able to do so always. Therefore, although we have failed, we fifteen nations - the five in the Security Council that might vote for this item and the ten outside that cannot vote - in this task of ours which we considered to be our duty, shall have been defeated by six nations. The world will draw its own conclusions. What can be done at this stage to remedy this sorry situation? Is there anything left by which we as the United Nation, can redeem our honour a little? If the Security Council is determined to reject this item, I am afraid there is nothing that is left along those lines, except perhaps one small matter which the Security Council in its wisdom, might consent to do. The eleven nations that presented this case have asked that under Rule 37, they should be allowed to come to the Security Council to present their case. That occasion has not arrived at all. That occasion, on the assumption of which they made the original request, will not arise unless the item is adopted. They have been rebuffed, or, they will have been rebuffed as soon as the vote is taken. In the meantime, in this procedural debate, they have been insulted. Ten nations outside the Security Council, and one nation inside it, that took up this cause in the interests of international peace have been insulted by my French colleague. He has accused them of having made statements for purposes of propaganda. I know that he may not feel so certain of some of us as he may of others, but I take the farthest country of all -what propaganda purposes could the Philippines have in its mind in bringing up this question before the Security Council? The representative of France has called these delegations and their Governments names in the Security Council during a procedural debate at a time when the question of putting this item on the agenda was being discussed and had not yet been decided upon. After this, ten nations and their representatives have submitted a request that if, in the end, they are bound to be defeated, they might at least be given in all decency the moral right of reply. They have been called names; they have no means of replying to them. We, in all our discussions in the United Nations and elsewhere, have recognized the right of reply to be an inalienable right. Perhaps the Security Council, having discussed the Tunisian question and having rebuffed ten or eleven nations, might at least redeem itself by calling these ten nations to the Council table so that they should be in a position to answer in some detail the charges of lying, the charges of propaganda and the charges of making tendentious statements, which were levelled against them by the French representative at our meeting last Friday. My delegation therefore proposes that, before we come to any decision on the item before us, we should, as the Security Council, extend an invitation to the ten countries which have written in to the Security Council today and whose letters I read at the beginning of this discussion, an invitation to come to the Security Council and exercise their moral right of reply to the allegations made against them by the representative of France. That ends my intervention as the representative of Pakistan.